Aging is a natural trend towards an increase in the proportion of older people in our population and will continue until the Canadian population stabilizes. The aging trend is merely part of the much larger demographic transition which has accompanied the development of our modern societies. 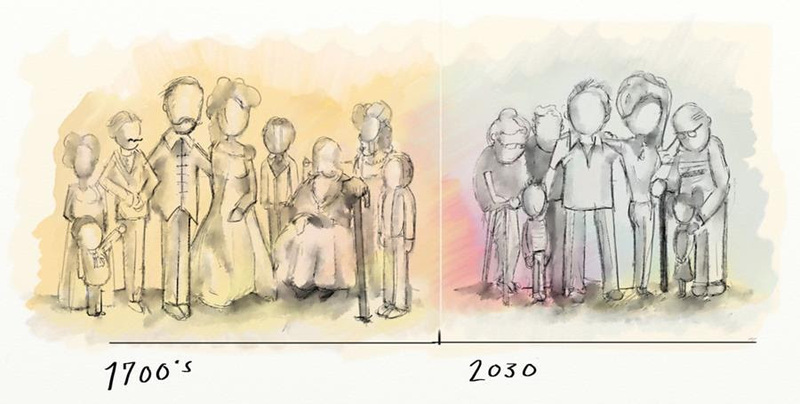 In this transition, life expectancy has increased from under 40 years in the 1700s to nearly 80 and the number of children per woman has decreased from 6 to near 2. Aging is inevitable and simply cannot be reversed except by catastrophic population collapse or exponential population growth continuing forever. Aging cannot be supported endlessly by fiscal deficits with the expectation that “growth will pay for it”. Growth does not pay for past deficits as a larger version of a debt producing fiscal structure adds on even larger debts going forward. Very high levels of immigration has been touted as a “fix” for an aging population. The objective of this fix seems to be to maintain forever the age structure and the rate of growth of the baby boom period. Ie make it the 1950s forever. Attempting to boost immigration to levels which will run ahead of the aging trend will see extreme and ever-increasing levels of immigration with little effect on the age structure. Understanding the nature of the changes and modifying our expectations of endless growth are the challenges which all countries will have to meet. Canada is fortunate in that many advanced societies are decades ahead in this transition and are providing an excellent reference for the development of policies which will allow us to deal successfully with the transition to demographic stability. The best means of dealing with a shift to a higher proportion of seniors is to boost job quality and flexibility along with wage rates. People must be encouraged to be healthy and the concept of working well past the age previously thought of as “retirement age” must be embraced. Neither Business-as-Usual nor Business-as-it-Once-Was is sustainable. Make sure your media sources and your political representatives are clear on the need for well-informed progressive change in Canadian public policy. “More of the same” is not a viable strategy. Our group believes that only a comprehensive strategy with relevant national metrics and clear goals can deliver long term social stability and environmental balance. It seems to be as difficult to persuade people of that endless growth is not the answer as it was once to convince society and authorities that the Earth was not the centre of the Universe or the solar system.